The Department of Justice announced Thursday that it had filed a statement of interest in support of a group of students and parents suing Harvard University for alleged discrimination against Asian-American applicants. 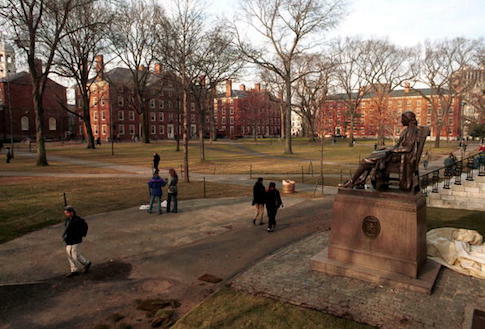 The group, Students for Fair Admissions, have alleged that Harvard has consistently discriminated against Asian students, deploying tactics that many compared to efforts to exclude Jews from the Ivy League in the early 20th century. A statistical analysis of more than 160,000 student records—filed in federal court in Boston by SFA—found that Harvard systematically ranked Asian-American applicants lower than their peers on subjective measures of quality like "positive personality," likability, courage, kindness, and being "widely respected." While Asian-American students consistently outranked their non-Asian peers on measures of academic achievement, these personality assessments "dragged down their chances of being admitted," according to the New York Times. The DOJ, in its Thursday statement, concurred with the students that "Harvard has failed to show that it does not unlawfully discriminate against Asian Americans." Specifically, it has failed to evidence that it is not in violation of Title VI of the Civil Rights Act of 1964, which forbid discrimination on the basis of race, color, or national origin in programs that receive federal funding. As such, the DOJ argued, the plaintiffs should be allowed to proceed to trial. "No American should be denied admission to school because of their race," said Attorney General Jeff Sessions. "As a recipient of taxpayer dollars, Harvard has a responsibility to conduct its admissions policy without racial discrimination by using meaningful admissions criteria that meet lawful requirements. The Department of Justice has the responsibility to protect the civil rights of the American people. This case is significant because the admissions policies at our colleges and universities are important and must be conducted lawfully." The DOJ contended in its statement that Harvard has admitted to using race in its admissions process, but has provided no explanation of how it weighs race against other factors—like a student's test scores—and how it limits its use of race to avoid illegal discrimination. The Department specifically highlighted Harvard's use of the subjective "personality rating" as evidence of its discriminatory practices. It also notes that the evidence shows, that Harvard admissions officers and committees consistently monitor and manipulate the racial makeup of incoming classes, which has resulted in stable racial demographics in Harvard's admitted classes from year to year. Such attempts to racially balance classes were declared "patently unconstitutional" in a 2003 Supreme Court case. Harvard has also never attempted to identify alternative, race-neutral ways to produce a diverse student body, the DOJ said, in spite of its legal obligation to do so. Thursday's statement is not the first action the DOJ has taken on Harvard's discriminatory practices. Based on a complaint filed by more than 60 Asian-American organizations, the Department initiated an investigation for violation of Title VI in 2017. This entry was posted in Issues and tagged College Campuses, Department of Justice, Harvard. Bookmark the permalink.